We all know what starfishes and sea urchins look like. But not many people know that their larvae don't resemble their parents at all. This portrait gallery will introduce you to some of the most common types of larvae of echinoderms. The image on the right shows a young brittlestar. 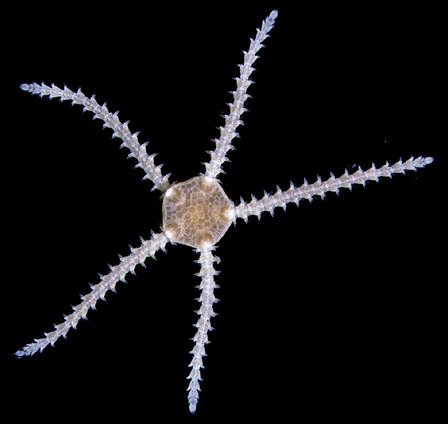 Like most echinoderms it has five arms. The next image will show you what a larva of a brittlestar looks like. Several Micscape articles about Echinoderms can be found via the Micscape search page. This gallery will also give you links to several Micscape articles about related subjects. Published in the July 2000 edition of Micscape Magazine.